Disclaimer: I am a lover of Android, Windows Phone, Windows 8, and in general dislike Apple - but I'll try to keep my points in this article clear of most bias. 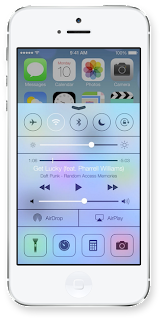 Additionally, the features of iOS7 that have been revealed are in Beta and are subject to change. I, myself, am a huge fan of Flat Design, and sort of an amateur designer (professional developer). As such, Flat design or "Almost Flat" design greatly appeals to me. Working without all the flashiness of the early oughts allows me to focus on a more content-oriented design and doesn't require many skills with a graphics editing suite for general work. However, this article isn't about me. It's about Apple, and how their attempt at flat design just barely misses the mark. 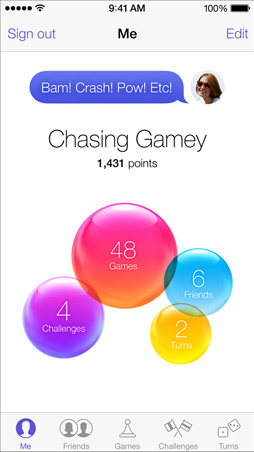 I honestly can't figure out what Apple thought it was doing with the Frosted Glass look. On it's own, it presents a fairly nifty effect - but it does not fit in with Flat Design, and barely even works in the scenarios they've placed it. 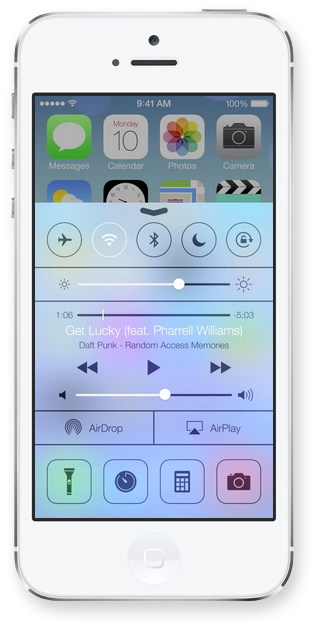 This picture of Control Center, for example, uses the Frosted Glass backdrop to overlay the iOS homepage. Blurring the icons behind it and leaving it with a variable and colourful background. "Thats beautiful!" one might exclaim, but if you look closely you'll see there are many problems with it. For one, the variance of colours washes out the content - the most important part of the user interface. While my eyes are admittedly not the best, the white text of the song title "Get Lucky" by Daft Punk blurs into the background, as does the other white objects. They don't stand out at all where, in this case, they're exactly the type of content that should be standing out. The end result appears "pretty" but ends up leading to a colourful and tacky experience. Icon inconsistency is a common scourge amongst smartphone operating systems. However, from my limited experience with Apple this hasn't been the case. Icons on Apple have always seemed to feel the same, with their slight gloss, roundedness, and lack of attempt to be anything else. Here, however, Apple's own icons are vastly inconsistent with each other. Here you can see the icons for the Photos, Camera, and Weather apps all together. It seems to be a very sorry state for the icons as none of them use the same style. 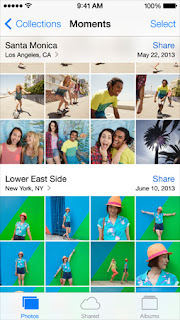 I didn't even have to rummage around for three examples - they were presented to me by Apple on their design page. While they're not consistent with each other, they at least seem to bear some facet of consistency with the other icons on iOS. Three distinct styles appear in the iOS7 icons. I'll refer to them as they're used in the pictures above, from left to right. You have the flat style, which uses absolute minimalism to get the point of the app across. You have the light to dark gradient style, which produces a slight raised effect, and then you have the dark to light gradient style, which appears to produce a slight well. None of these icons exhibit the same design decisions, which leads to a very cluttered and busy looking home screen - even if it's not. This is, luckily, one of the aspects that is most likely to change. The lack of completely obvious skeuomorphism is gone, which is nice - but what the heck is even going on here? The bubbles are 3D and the text has a gradient background on it. At least they're using the accent colour? While the font is beautiful and the use of a single accent colour throughout the application looks nice, but using it for calls-to-action can be a bit strange and jarring - pulling the user's attention away from content such as the title and presenting opportunities where icons would have been a better fit. In the header, Moments looks out of place due to how close "Collections," what's being marked as the previous screen, is to it - and it makes Select seem very far away. This experience only gets more awkward when longer human selected titles are used. In this case, "Moments" is the title of a Collection. If that collection was the name of an event, and much longer than 7 characters, how much stranger would it look? In the footer, you have Photos - big, bold, and bright as a selected icon - and then you have the other icons. Shared and Albums, a very soft gray that becomes increasingly difficult to see on the white frosted glass background of the footer. While there are many more places where I can point out design inconsistency (and many neat features and eye candy I won't bother to point out), it is worthy of applause that Apple has tried so very hard to change their OS to be cleaner and less skeuomorphic. However, in their attempt to do so they seem to have swerved off the road into unknown land. The designs unveiled today are an inconsistent smosh of flat, deep, and skeuomorphic design that when combined as they have makes absolutely no sense. Apple needs to pick a direction for their user interface and stick with it throughout.